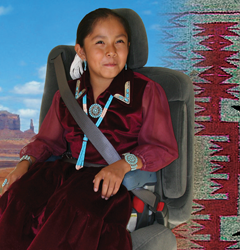 Navajo Nation has a primary seat Belt & car seat Law? TCRHCC Obstetrics Unit has a policy Regarding new born babies? Stop wondering; find out if it’s being used correctly. Child Passenger Safety Technicians on hand. No children during Session 1. Parents need to attend both sessions. Child & Vehicle must be present during Session 2. Properly select a car seat for your child. As an expectant mother, always wear your seat belt to protect you and your unborn child. Wear the lap belt across your hips and below your belly with the shoulder belt across your chest between your breasts. Once your baby is born, follow these important safety steps. Rear-facing car seat: The safest place for your infant baby is in the back seat, in a rear-facing car seat up to age two and at least 20 pounds. 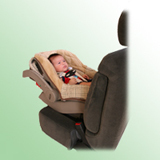 Read the car seat label: Rear-facing car seats have height and weight restrictions. 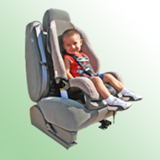 Convertible - forward-facing car seat: When your child, up to age one and 20-40 lbs., outgrows their rear-facing car seat continue to buckle-up your child in a convertible car seat in a rear-facing direction in the back seat, until the upper weight or height restrictions of that particular convertible car seat is reached. Booster seat: Once your child outgrows their forward-facing car seat, (usually at age 12 or are less than 4’9” in height) have them buckle up in a booster seat, in the back seat. A seat belt fits properly when the lap belt lays across the upper thighs and the shoulder belt fits across the chest. Seat Belt: When your child outgrows their booster seat, (usually at age 12 or are less than 4’9” in height) your child can buckle-up in the adult seat belt in the back seat. A seat belt fits properly when lap belt lays across the upper thighs and the shoulder belt fits across the chest. Workshops. Buckle-up all children under age 13 in the back seat. Always read the car seat instructions and the vehicle owner’s manual. Because many state laws only require children to be in a car seat up to age 4 or so, many parents think older kids are safe in just an adult safety belt. However, all children need to be buckled up correctly - every trip, every time.